A lioness who had her claws removed so ‘tourists could play with her’ has been rescued from a zoo, along with every other animal in there. Rafah Zoo, in Gaza, was evacuated over the weekend as an animal welfare group made it their mission to get all the animals to safety. The zoo made headlines earlier this year when distressing footage of a young lioness getting declawed went viral, with welfare groups calling for the zoo to get shut down. #SaveGazaAnimals: The rescue has started! More than 40 animals have now been moved out of the so-called ‘Zoo of Sorrows,’ in which animals were living in ‘terrible conditions’ and cages which were too small for them. Four Paws, an international animal welfare organisation, made the decision to rescue the animals yesterday (April 7), taking lions, monkeys, peacocks, and wolves away from the enclosure. The 47 animals were sedated for the 300km journey to a reserve in Jordan, with authorities in Israel giving their permission for the transfer, the BBC reports. The organisation admitted they were ‘unsure’ of how the rescue would go due to the unstable situation in the region and last week’s setback of borders being closed. However, just one day later they took to social media to announce their mission had been successful. 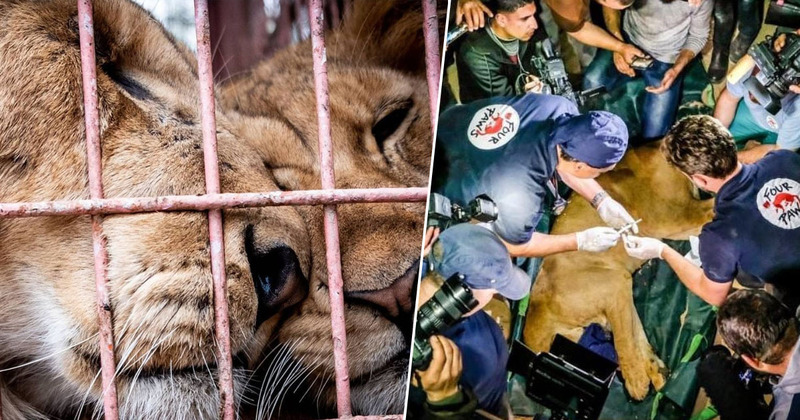 Four Paws had been campaigning to get the zoo shut down for months, ever since the horrifying footage of the lioness being brutally declawed went viral. The lioness had to suffer unimaginable pain as her claws were removed with a pair of shears – all so visitors of the zoo could ‘play’ with her. This exposed the persisting poor conditions the animals at Gaza’s Rafah Zoo have to endure. There is no means for proper nutrition, medical care, or shelter, leaving animals neglected and exposed to further brutality and uncertainty. The animal welfare group strongly condemned the zoo’s owner, Fathy Jomaa, for the treatment of the animals. However, Jomaa blamed the zoo’s squalid conditions on the Israeli and Egyptian blockades of Gaza and bad economic conditions. When we raise a cat for a week or a month we feel sad to lose it but what about suddenly losing animals that I have lived with for 20 years? The team – with full cooperation from the authorities – loaded the 47 animals into crates in just one day, successfully rescuing them from the poor conditions. Hopefully the animals will live in safe and happy environments from now on, and will be able to make a full recovery.